Have you ever lost pens, paints, brushes, etc. while out urban sketching. I have. Several years ago I lost my entire paint kit somewhere between sketching site and home and that loss was traumatic. The palette was inexpensive, the case was a favorite, and that kit contained several Escoda sable travel brushes. I nearly cried. But all of it was replaceable and my sketching regime hardly skipped a beat. I’m dealing with another loss, however, and I while I hope it’s temporary, it’s much harder to overcome. I’ve lost my ability to walk more than across the room. It started with my ankle and then my knee. Right now the leg between the two is the size of a telephone pole and I’m spending a lot of time with doctors. If I were a “true” urban sketcher I suppose I’d be sharing lots of sketches of medical machinery but I’m not that kind of urban sketcher, I suppose. Besides, the pain and stress have been distracting. I won’t bore you with details but I’ve been diagnosed and I’ve just started some physiotherapy yesterday that sounds encouraging. 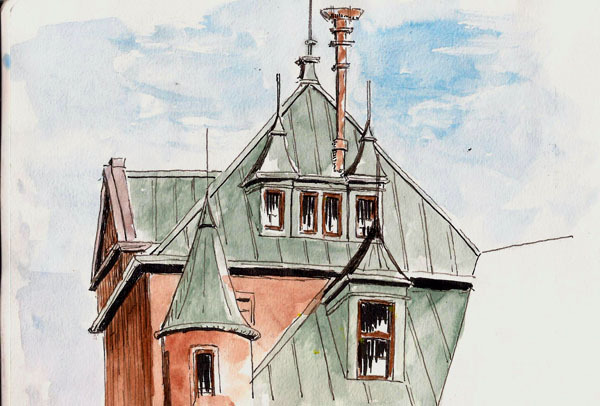 The ramifications for this blog is that because I can’t wander the streets of Quebec City, I can’t draw the streets of Quebec City so the nature of my sketches will probably change, at least in the short term. Irony of ironies, I’ve waited all summer for decent weather and we’re finally getting a string of beautiful days. Such is my luck sometimes. The upside is that this is a good opportunity to do some experimentation and maybe I can even convince myself that I can draw from a photograph and enjoy it. 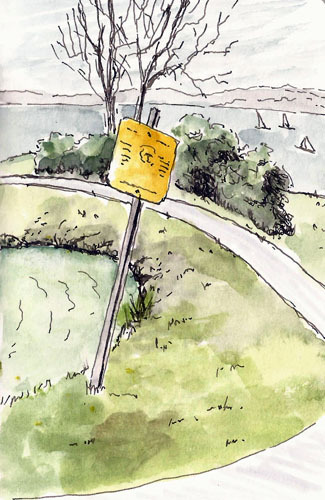 For now, I leave you with a sketch I did after hobbling along a beach on the south shore of the St. Lawrence River last week. I’m a lucky guy because I’ve had the opportunity to sketch with Marc Taro Holmes on occasion. Not only is he one of the best sketchers in the world, he’s also a really nice guy and it’s really fun to sketch with him. But this past weekend was really special because I was sketching with him and I was going to meet Liz Steel and Anne-Laure Jacquart because they were visiting Marc and Shari in Montreal. 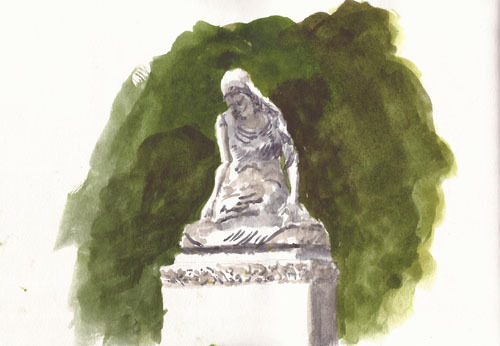 On Thursday, though, it was just Marc and I and we headed towards Mont Royal Cemetery to draw statues. 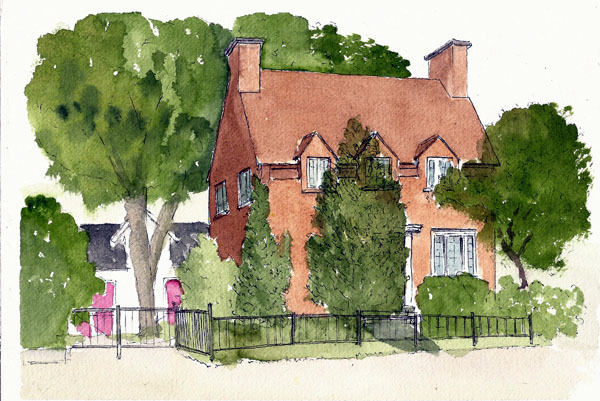 Along the way we stopped, set up shop on the sidewalk, and drew a wonderful house, undoubtedly built just so we could sketch it. I’m afraid I got a bit clumsy and heavy-handed with the paint on this one but I present the results anyways. That’s just the kind of guy I am (grin). Marc has started skipping the pen stuff and he’s drawing directly with paint and we started talking about that as we walked along. Marc’s not a guy who does a hard-sell on anything but he has a way of making you want to try new things. And so I did. This is the first time I’ve ever done anything with paint that wasn’t coloring inside the lines and, well, I have a lot to learn. 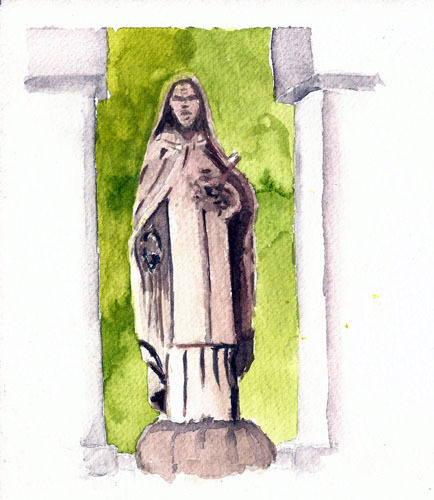 Undaunted by all the things I didn’t understand about this process, I continued, doing this second statue. Work in both negative and positive space to define shapes. Paint must be mixed thicker than wash consistency to be an effective drawing tool. To achieve light colors that are sufficiently thick for drawing requires mixing light neutral colors into the mix. Marc uses DS Buff Titanium and Holbein’s Davey’s Gray for this. Large contrasts between foreground and background pay large dividends. Oh…and this is probably the most important thing I’ve learned. Larry needs a LOT more brush time cuz he can’t draw a straight line with a brush to save his soul. At this point it was looking like rain and we were both hungry so we hopped on the metro and headed for lunch. I guess we’re not dedicated sketchers because we sat eating sandwiches and talked about the future of urban sketching the rest of the afternoon, not lifting pen nor brush the rest of the day. But, as Scarlett said, “Tomorrow is another day,” and we had a big day planned. I think we must be setting a record for sitting in alleyways while drawing. Sort of goofy I suppose but alleyways do present scenes with a lot of personality, albeit a somewhat humble form of it. Claudette and I both chose this scene. I get the impression that the door on the right leads to an empty building but I could be wrong. In any event, I had fun drawing this one and we’ll probably all be back in the “ruelles” again. 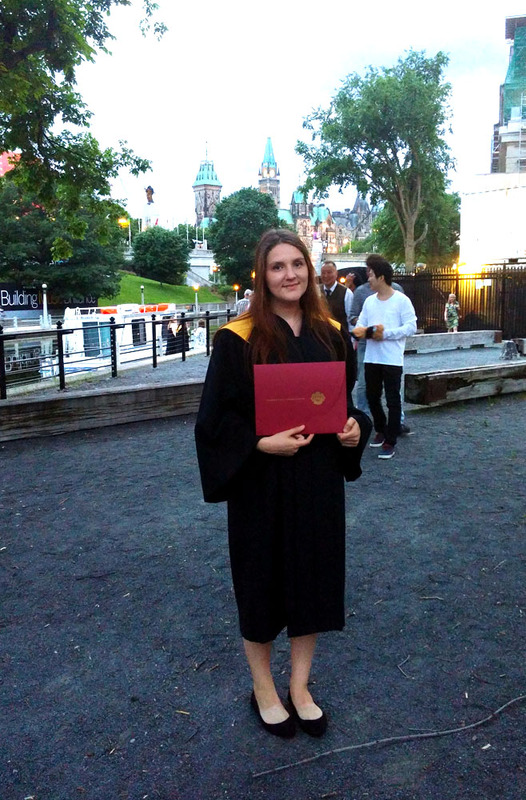 Sorry for forgetting to write blog posts. I spent a day in the emergency ward as some really nice nurses tried to get my heart under control. Now I’m trying to get used to medications and the side-effects have caused me to lose my motivation to do much of anything. But, our group went to visit the Bagatelle, a large house and garden that has become a place where art exhibitions are held here in Quebec. This month it’s origami and what a show it was. It’s a two-story house and most of the rooms on both floors were filled with amazing origami pieces. 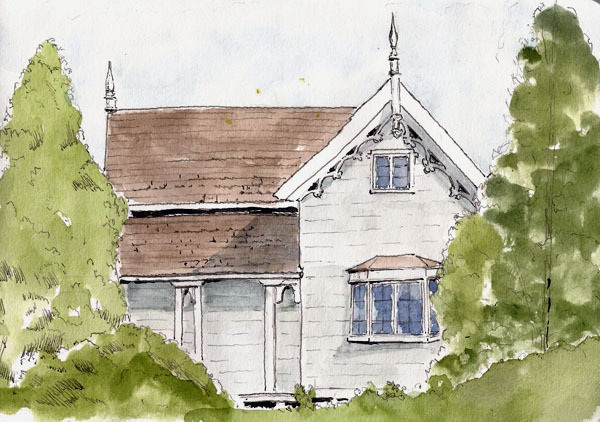 I sat down in the garden and drew one side of the house as it could be seen through the trees. Hope you like it as much as I enjoyed drawing it. 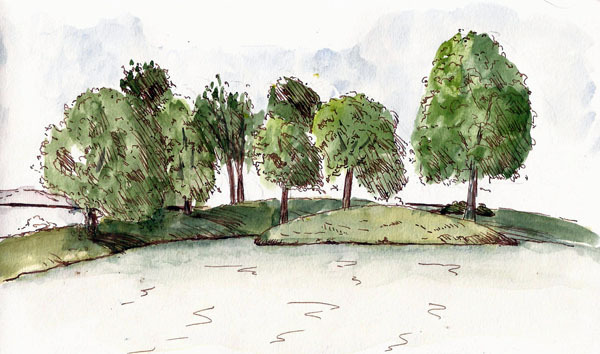 What’s your ideal sketching day? I think mine is spending the day at Miriam’s cottage. Miriam’s cottage is an idyllic place on a large island in the St. Lawrence River, near Quebec City. 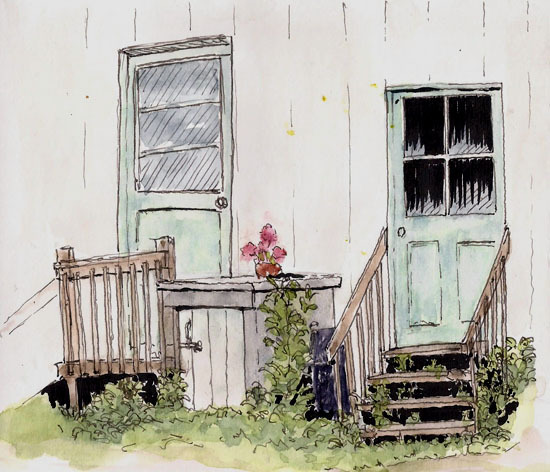 She’s got a wonderful artist’s cottage, a huge barn full of sketchable stuff, and a chunk of land you could get lost in as long as you didn’t run out of paper. All of that would be great enough but there’s also Miriam, who is an inspiration. She approaches art the way we all did as kids. She’s very much a “let’s try this” and “just have fun” kind of gal. Her house has one wall with animal heads looking down on the proceedings. These are not just any old animals either. There’s a unicorn among them and all are made from paper mache. In her loft there’s an full size man done using similar materials. She draws with abandon and with considerable skill, choosing her tools on a whim. It’s hard not to be humbled and harder still not to be thrilled just to be there. Her dog Nikki is a joy and he loves to sit at a sketcher’s feet, apparently enjoying our silence, or maybe the scratching of a pen on paper. Yvan and I went out to visit her a few days ago. It was a rainy day but we were able to find cover and did some drawing. The first drawing I did was this one. 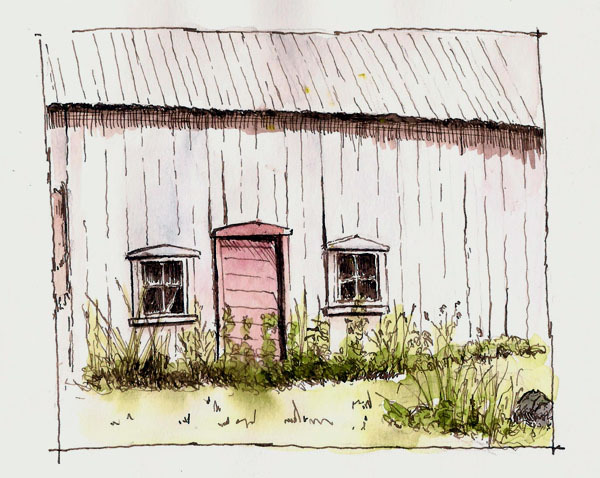 Yvan was drawing next to me and I grumbled about how hard it was to draw this simple scene because nothing on this old barn was in alignment as it should be. He took that as an opportunity to give me an art lesson and we had a great conversation about lines, squinting, and my problems with both things. It was perfect. 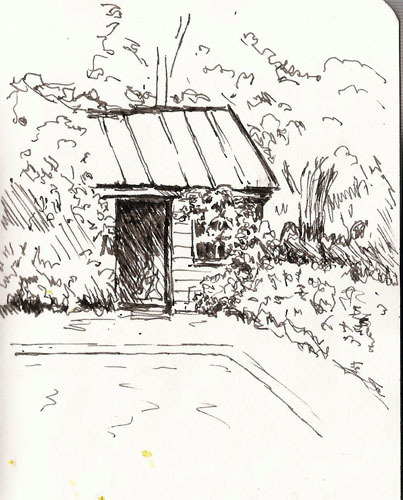 I got out my little S&B Epsilon (3.5×5.5) book and drew this small sketch of the pool shed, trying to keep what Yvan had talked about in mind. Then it was time for lunch so we headed to the deck, put up an umbrella over a table and ourselves and then spent an hour or so eating and enjoying each other’s company. Miriam’s sister, Sarah, joined us. The rain stopped and we decided that we should walk a bit so we headed down the hill, down the road and ended up at low tide next to the St. Lawrence. 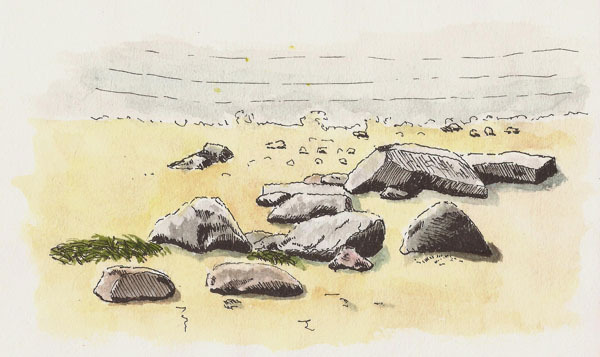 In this location, huge rocks are exposed at low tide and we got the bright idea to try to do a drawing, in spite of the fact that it was threatening more rain. I only had my little sketchbook with me and a Pilot 78G but that was enough. 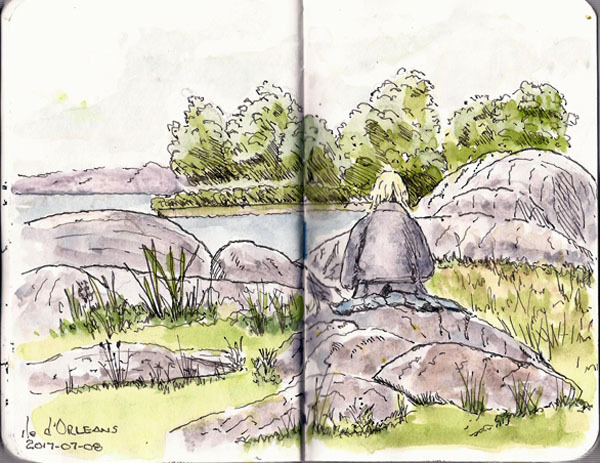 I sat down behind where Miriam was sketching and drew her and the surrounding rocks. I had no color with me but it didn’t much matter because I had to rush the last few lines because the rain had started to fall again. I added the color when I got home. We climbed the hill back to Miriam’s place and all agreed that we were going to have to do this again…and maybe again. It was, indeed, an ideal sketching day. It’s well-known that I’m a slower than molasses sketcher, but I am making a concerted effort t speed things up. The big problem is that when I do everything else goes downhill and I get frustrated. Such is my life but I keep trying. A few posts ago I talked about some sketching I’d done one morning, including a quick sketch from a photo of a scene not far from my house. I decided to go to that location and do it again. Here it is, this one done in a Stillman & Birn Alpha (8.5×5.5) and with a dab of color added. It seems as though we won’t be having a summer this year. 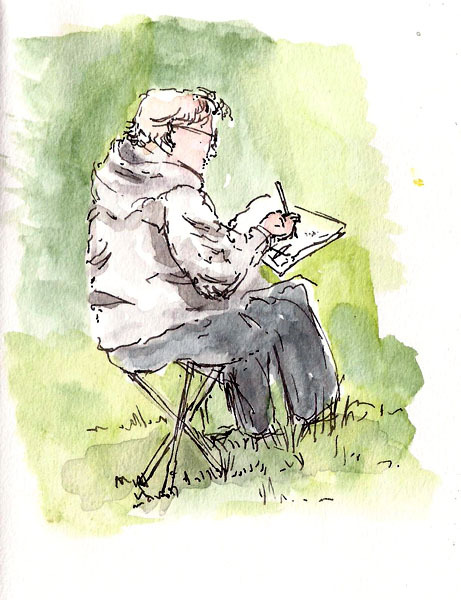 Lots of rain and temps cool enough that we’re back to wearing jackets to go sketching. Pretty odd for July, even in Quebec City. 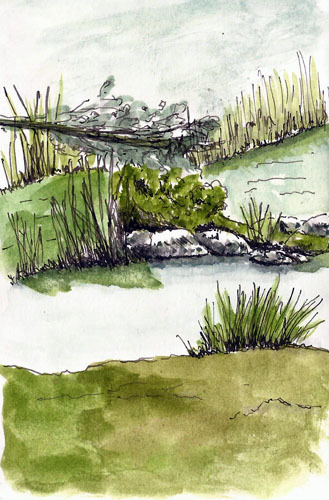 We headed to a large garden in Ste-Foy last week for a sketching session. Reports said the rain wouldn’t start until late afternoon, though it looked as though it could rain at any minute. We’re getting used to the dull days, though, so we didn’t think much of it. The garden brought reality home to roost. There were so few flowers, so little growth. The trees and grass were all very green, probably because of the rain, but the garden plants looked like it was April. Everyone cast around for something to draw and I started by drawing on of my fellow sketchers. I admit my heart wasn’t into it but a quick sketch was done quickly. After this I got up and started wandering the grounds, around and around I went. Nothing inspired. There were some people weeding some large beds and they had a small garden vehicle in support. I decided “why not” and sat down to draw it. 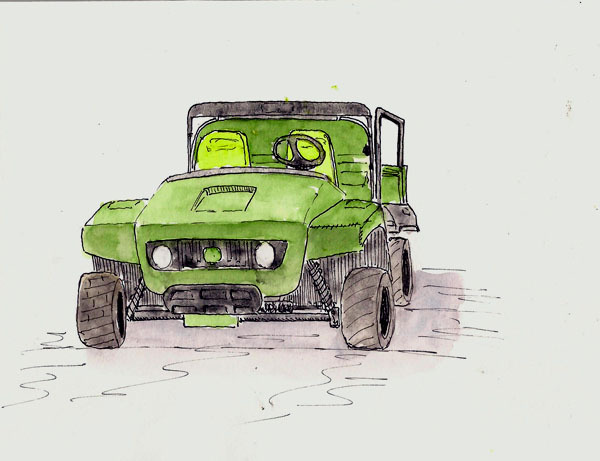 A woman came over and asked if I wanted her to move the vehicle, thinking I wanted to draw the garden, but I explained that I was going to draw the vehicle. She laughed, probably thought I was nuts, and I set to work. Here’s what I came up with. Not a Rembrandt but it sure was fun to draw. I do almost all of my sketching on location so I’m very comfortable doing so. There is one circumstance, however, that I find challenging. Looking up at the subject to be sketched always seems harder than it should be. I don’t know if there’s something about the upward-looking angle or the fact that I have to bob my head through a much larger angle between subject and paper. In any case, getting the proportions and perspective correct is always harder. 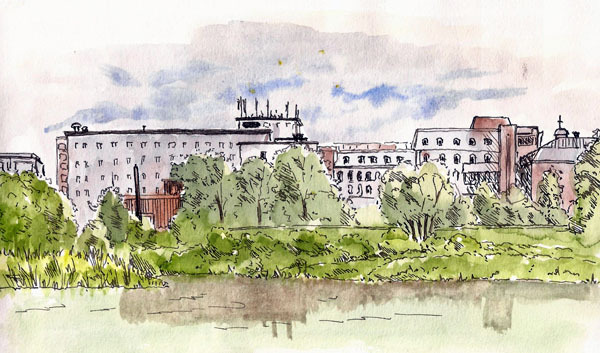 We were sketching at the train station, though, and I drew this portion of one of the buildings. Quebec is blessed with these sorts of rooftops and so looking up is is worth the effort.